The next American Literature Association (ALA) annual conference will be held May 23–26, 2019, in Boston, MA. Below are calls for papers for the five panels sponsored by the Circle for Asian American Literary Studies (CAALS), which also holds its annual business meeting at ALA. Please note that if your proposal is accepted and you agree to participate, you will need to become a member of CAALS prior to presenting, in addition to registering for the conference. For more information, please visit our website at http://caals.org/. Asian Americans have become increasingly visible to the public eye in various realms. Recent cinematic imaginations such as Crazy Rich Asians, To All the Boys I’ve Loved Before, and Searching and bestselling or prizewinning literature by authors like Viet Thanh Nguyen, Marjorie Liu, and Hanya Yanagihara have all contributed to a growing national conversation around Asian Americans and representations of Asian Americans. However, while there are experiences and voices that become more visible through these forms, there are others that remain, or even become, increasingly more invisible. We welcome inquiries into the asymmetries in Asian American in/visibility through various approaches, topics, and areas. For instance, how can we think about the invisible vis-à-vis the visible in Asian America? What are some of the productive tensions between them? Could some become more invisible because of the hyper-visible, or vice versa? Could this, perhaps, offer new insights for conceptualizing Asian American in/visibility? How do various genres play into this asymmetry? What populations are particularly susceptible to in/visibility in Asian American cultural production? What role does geography play in making some more visible than others? Please email a proposal (max. 250 words) and a brief CV to Na-Rae Kim (na-rae.kim@uconn.edu) and Laura Wright (lawright@berry.edu) by Monday, January 14, 2019. Please be sure to mention any technological needs for your presentation. For the last two and a half decades, debates around the characteristics, uses, and politics of “Asian American” as a critical rubric have compelled a scholarly critique of identity, auguring what some term a postidentity turn. Asian American literary studies has been at the forefront of contemplating the fissures of identity and its dis-contents. Susan Koshy and Lisa Lowe interrogate how invocations of Asian American identity unwittingly replicate modes of power aligned with nationalist ideals that suppress difference. Therefore, rather than approach “Asian American” as a descriptor of a subjectivity to be accomplished, Kandice Chuh posits Asian Americanist critique as an analytic premised on a “subjectless discourse.” Relatedly, Viet Nguyen critiques the privileging of resistance in ethnic studies and scholarly assumptions of a homogeneous set of radical politics under “Asian American.” Moreover, scholarship on war, empire, and displacement by intellectuals such as Yến Lê Espiritu, Mimi Nguyen, and Cathy Schlund-Vials further attest to the limits and inadequacies of grounding identity as the political platform for racial justice. In short, these scholars collectively interrogate cultural-nationalist attachments to the forms of identity and the nation-state as the bases for the theoretical and political work of Asian American studies. Meanwhile, renewed attention to formalism in literary studies has turned our attention to how race resides not merely as embodied difference but is also shaped through discursive arrangements, narratological techniques, and the ordering logics of social, political, and economic distributions. These studies of the formal and the aesthetic in Asian American literary studies complicate how a prioritization of apprehending content and context in literatures concretize fixed notions of identity. Instead, scholars beckon us to take seriously how Asian Americanness becomes articulated, reworked, and transformed through updated racial and literary forms. This panel thus invites papers that grapple broadly with these questions of Asian American literary form. Specifically, in what ways might the formal, aesthetic, and experimental properties of literature shift conventional understandings about racial difference and Asian American critique? How can literature animate innovative approaches and insights into what Colleen Lye generatively terms “racial form”? How might attending to form nuance the political and affective work of discontent that Asian American literatures enact? Please email your proposal (max. 250 words) and a brief CV (max. 500 words) to Chris Eng at ceng02@syr.edu by Monday, January 14, 2019. Please be sure to mention any technological needs for your presentation. The theme of travel is deeply imbedded in both fiction and nonfiction. Even more so in literature centered on the diasporic experience, conditions of human displacement are prominent. Dislocation—whether by geography, culture, or identity—is a trope regularly revisited in Asian American writing. States of refugeeism, exile by political dissidence, nomadism, economic migration, or tourism—these diverse forms of displacement encompass the transnational Asian American narrative. If travel is about shifts through space and time, then the concept of identity can be seen as an equally fluid and mutable phenomenon. The idea that movement and crossing borders, imagined or real, effect change to one’s sense of self is a common theme expressed in a range of representations, from literary to nonliterary genres. Therefore, the notion that travel is transformative and the experience can shape one’s identity is central. In other words, the journey is not only through an external geographic landscape but the interior of the mind. This panel invites proposals on a rich range of mediums and genres—filmic, pictorial, verse, or prose—that examines travel and identity as two wedded tropes. Such text-and-visual-based mediums may include graphic novels and comics, historiography, historical fiction, autobiography and memoir, to name a very few. Works of fiction and nonfiction articulating the profound ways unfamiliar, and once familiar, environments color a dynamic selfhood in Asian American storytelling are welcome. Again, the definition of storytelling here embraces a wide breadth of mediums and genres. If your interest lies in Asian American diasporic and/or transnationalism studies in general, we encourage you to participate. Please email your proposal (max. 250 words) and a brief CV (max. 500 words) to Min Lee at m4lee@ucsd.edu by Monday, January 14, 2019. Please be sure to mention any technological needs for your presentation. The term “Asian America,” as opposed to Asian American, had a miniscule presence in scholarly or creative work until the year 2000, but has undergone a surge in Asian American Studies academic writing over the past 20 years. Despite the rootedness and place making implied by this spatial terminology, Asian America is a mobile concept that travels quite liberally in intellectual circles, crafting a rather disorienting conceptual history. This panel will address the relationship between Asian Americans and the space they inhabit, queering how Asian America circulates in the literary imagination. Potential submissions could address literary presentations of Asian American space, the commodification of Asian America, the transnational allure of Asian American space, and Asian America as an inter-subjective formation. Please send a 200-300 word abstract and c.v. to Timothy K. August at timothy.august@stonybrook.edu by Monday, January 14, 2019. Please be sure to mention any technological needs for your presentation. We invite proposals on any aspect of Asian American literature and culture. Our aim is to provide a forum for new and innovative work in Asian American literary studies. Please email your proposal (max. 250 words) and a brief CV (max. 500 words) to Caroline Hong at caroline.hong@qc.cuny.edu by Monday, January 14, 2019. Please be sure to mention any technological needs for your presentation. The Essay Prize is awarded each year for the best paper presented by a graduate student at any CAALS-sponsored conference panel or any Asian American literature panel at the American Literature Association conference. This year, we had many wonderful nominations, leading to our decision to honor two essays. Both offer important, compelling contributions to the study of Asian American literature. We extend sincere thanks to our other nominees and nominators. It was our privilege to read such strong papers. Please consider submitting a paper proposal for one of our two CAALS-organized panels for AAAS 2019 (April 25–27, 2019, in Madison, WI)! In her book Partly Colored: Asian Americans and Racial Anomaly in the Segregated South (2010), Leslie Bow claims that Asian Americans are positioned between the two poles of black-and-white US race relations in a racially ambiguous liminal space called “the national in-between” (18). Asian Americans of mixed-race heritage are doubly positioned within this in-between space, as they are rendered racially ambiguous both in larger national conversations about racial categorization and in debates about racial identity within Asian American communities. Mixed-race Asian American subjects, then, particularly those who are able to pass as White or non-Asian, can be understood as existing within a space of ungovernability characterized by their ability to expose race as a social construction and to destabilize race as a legitimate factor in the state’s allocation of public resources and social privileges. This panel invites papers about literature, art, and film by Asian American writers and artists that explore racial ambiguity and/or racial passing within the mixed-race Asian American experience. Can racial passing be understood as a fugitive act or as a form of seeking sanctuary? How does the mixed-race Asian American body challenge the state’s biopolitical and necropolitical attempts to categorize and control racial bodies? In what ways might the ungovernability of the mixed-race Asian American body fuel antiracist work or activism? What is the responsibility, if any, of mixed-race Asian American subjects to engage with or problematize the state’s demands for the registration, vetting, and surveillance of specific racial bodies? Please email your abstract (max. 250 words) and a brief CV (max. 500 words) to Roberta Wolfson at wolfson@calpoly.edu by Wednesday, September 19, 2018. As Sau-ling Wong points out in “The Politics of Mobility,” physical movements in the US signify very differently to people of color and their white counterparts. While the mobility of the white settlers in the American frontier provided them with homesteading and entrepreneurial opportunities, for the brown and black populations who were enslaved and/or displaced from their homes by settler colonialism, mobility was mostly invested in fugitivity. This panel seeks to think about Asian American mobility—a topic that is often discussed within the socio-economic framework of upward mobility—through the lens of fugitivity, a concept that Fred Moten theorizes in the context of black studies as a “desire for the outside, for a playing or being outside, an outlaw edge proper to the now always already improper voice or instrument.” The longing for fugitivity is prevalent in Asian American literature too. For instance, Susan Choi’s 2003 novel American Woman presents an account of an Asian American female outlaw on the run with the character of Jenny Shimada navigating her roadmaps for survival while hiding out in the Rockies and the plains. Thinking with such fugitive figures as Jenny, and the topoi of fugitivity writ large, this panel welcome papers that further articulate the contours of (diasporic) Asian American fugitivity: what is its course, directionality, history, and geography? How is it expressed in fiction, poetry, drama, and other literary mediums? And what do these various definitions of fugitivity imply in their respective contexts? Please email your abstract (max. 250 words) and a brief CV (max. 500 words) to Kai Hang Cheang at kai.cheang@email.ucr.edu by Wednesday, September 19, 2018. 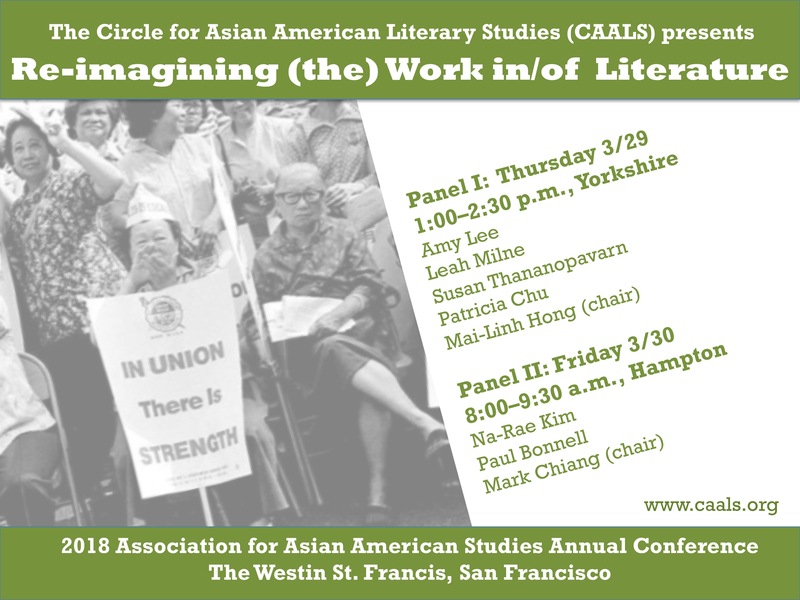 The Circle for Asian American Literary Studies (CAALS) is pleased to announce our schedule for this year’s American Literature Association conference, May 24-27, 2018, at the Hyatt Regency San Francisco. The hotel is located at 5 Embarcadero Center, San Francisco, CA. Questions may be directed to CAALS co-chairs Caroline Kyungah Hong (caroline.hong [at] qc.cuny.edu) or Mai-Linh Hong (mai-linh.hong [at] bucknell.edu). The next American Literature Association Meeting will be held in San Francisco, CA, May 24–27, 2018. Below are CFPs for the five panels sponsored by the Circle for Asian American Literary Studies (CAALS), which will also hold its annual business meeting at the conference. Please note that if your proposal is accepted and you agree to participate on a panel, you will need to become a member of CAALS prior to presenting, in addition to registering for the conference. For more information, please visit our website at http://caals.org/.